In the advertising world, most businesses have to deal with competitors. In traditional media, many publishers offer competitive separation, where your ads will be separated by physical space (in print) or time (in broadcast) from your competition. In search, though, your ads appear alongside your competitors. A search for books will yield ads from Amazon, Barnes & Noble, and possibly local retailers. They’re all competing with one another, on the same web page, for the click. 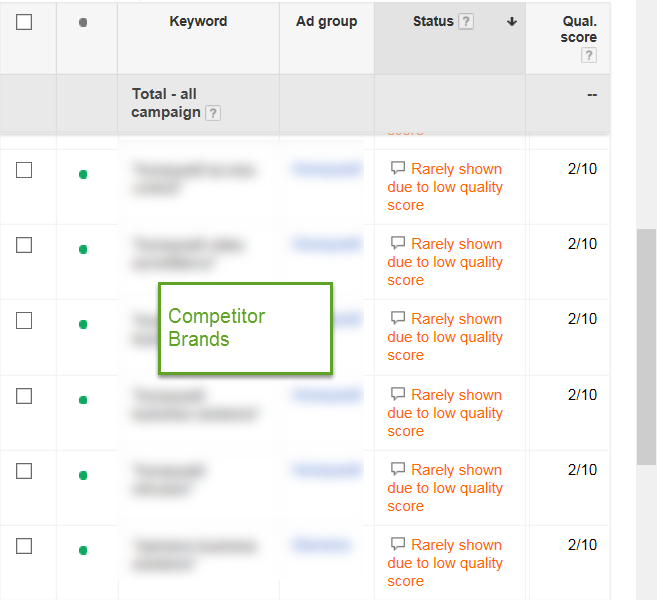 Many PPC advertisers are interested in bidding on their competitor’s brand names. Why not try to take visitors away from the other guys? It seems easy to do – but quality score creates a challenge. Anyone who’s ever tried to bid on competitor brands has probably gotten hit with poor quality scores. It makes sense – after all, if I searched for “Target stores,” why would I want to see ads from Walmart? The search engines know this, so they slap anyone who’s not Target with a quality score of 1 or 2. Still, there may be good reasons to bid on your competitor’s brands. Maybe you’re new to the market and need awareness. Maybe there’s confusion between your brand and a competitor, and you’re hoping to capitalize on that. Whatever the reason, it is possible to bid on competitor brands and get decent quality scores and traffic. Her are 3 sneaky ways to bid on competitor keywords. Does your competitor have a hard-to-spell or easily misspelled brand? Gather up all the possible misspellings and bid on them. Misspellings, to the search engines, are vague – do you mean the brand, or do you mean something else? When it’s not clear, your ad has a better chance of appearing. 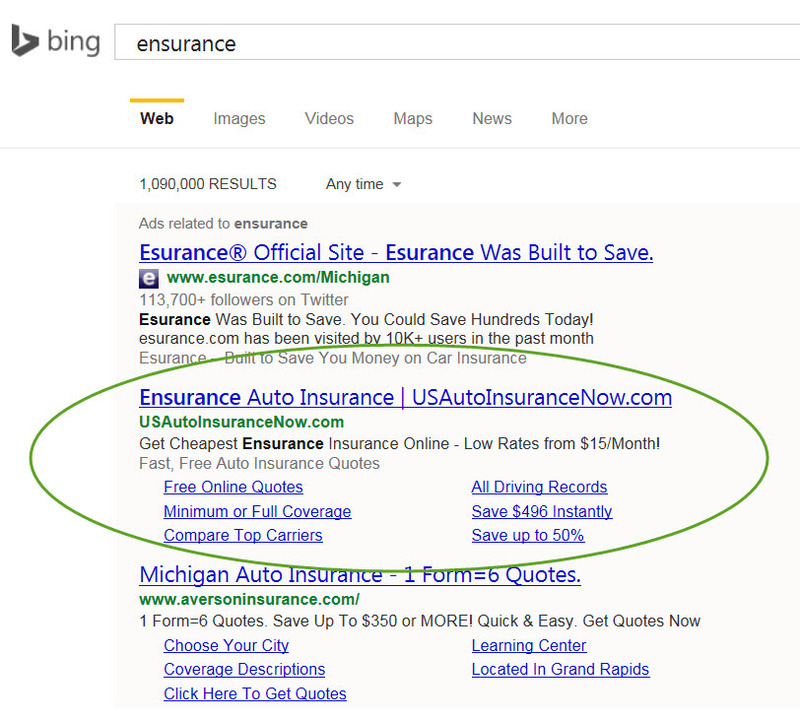 I meant to search for “esurance” – the auto insurance company. But I typed “ensurance” instead. Esurance still showed up as the top ad. But look at the second ad. It reads awkwardly – they’re probably using dynamic keyword insertion (DKI) – but the query I typed is in the ad twice, and therefore it’s bolded and stands out. They also have 6 sitelinks showing – more than the other advertisers in the top ads. And they’re promoting “Low Rates.” I had to read the ad carefully to realize it wasn’t for the company I meant to search for. Most users wouldn’t read carefully – they’d just click. Clever use of DKI, along with features like sitelinks, can help your ad stand out on misspellings of your competitor’s brands. What better way to reach disgruntled customers of competitors and woo them your way than by bidding on keywords used by those who want to cancel? Nearly every competitor brand name has a quality score of 2 and is rarely shown due to low quality score. Quality score jumped from 2 to 4-5, and even 10 in one case! And the “cancel” keywords are getting click-through rates that are well above average. Better yet, they’re driving leads. 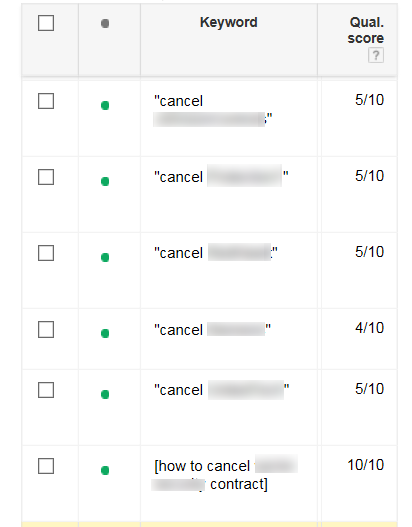 If you’re in a service or contractual business, adding “cancel” terms to your keyword list can dramatically improve results in your competitor campaigns. Use all the weapons available to you. It almost goes without saying that successful competitor campaigns need great ad copy. A killer offer and reasons to choose you usually perform well. I’ve seen competitors use exclusive, super-deal offers for competitor campaigns that aren’t promoted anywhere else, just to grab those conquest clicks. 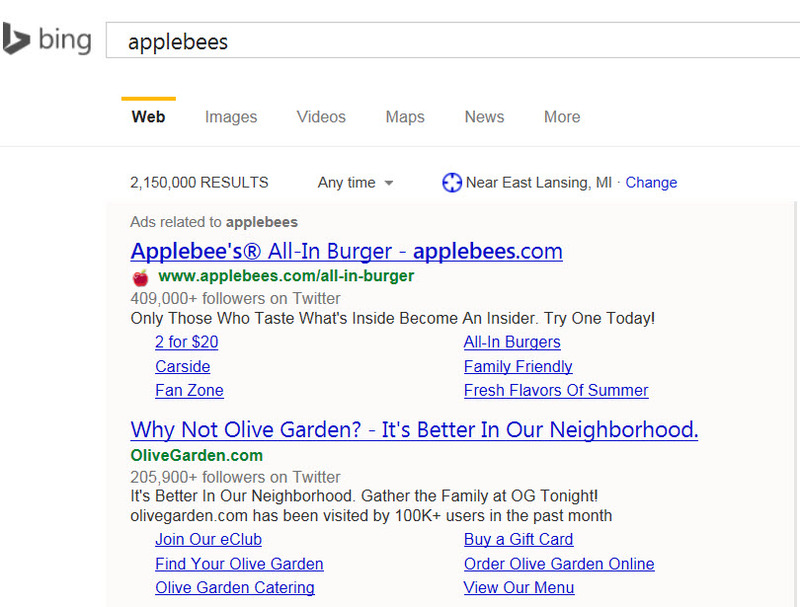 Not only is the Olive Garden ad clever, it’s also earned ad annotations from Bing Ads, showing they have 205,900 followers on Twitter and have been visited by 100K users in the past month. While advertisers can’t control ad annotations, they can control ad extensions. Use them to make your ad stand out on the page. You’ll need to earn a spot on the top of the page for most extensions to show, but ad extensions can be a real differentiator. Adgooroo isn’t bidding on their brand, and SpyFu is taking advantage. They’re using callout extensions and Google+ extensions to make their ad stand out on the page. I’ve also seen call extensions and location extensions used successfully on competitor ads – imagine if you discover that the business you were searching for is further away than a competitor offering the same thing! Give the searcher every possible reason to contact you instead of the competition, and your competitor campaigns can be a good source of quality traffic and sales or leads. Editor’s Note: This post originally appeared at Search Engine Watch on December 16, 2014. Great ideas Melissa! One of our Google reps this week had another idea of using Gmail Sponsored Promotions (GSP) if you can get in the beta. Good way of going after competitors, but not directly in search. Nice! Great tip Lisa – thanks for sharing! Have to say I disagree with a lot of this Melissa. For one the close variants is pretty much a dead horse on Adwords, which means it’s only months before Bing kills it too. #2 is a good one that I like. #3 I feel is really misleading. You are implying advertisers should go out and use others trademarks in an ad and I can’t get behind that. The rest of #3 is fine, but there is nothing that is strategically helping a reader get to a QS on competitive that will help them achieve a quality ad to have their extensions display. Hi Ira, thanks for your comments. Fair enough on the close variants; I agree that close variants are changing the game in PPC and may make this technique unnecessary. That said, I still believe it’s a good strategy, especially when combined with DKI. If you’re not bidding on the misspelling, it won’t show up in your ad. That alone is a good reason to do it. Re. #3, I’m not at all implying that advertisers should use competitor trademarks in their ads. The examples I gave don’t do that, and I don’t recommend it. I’m simply suggesting that advertisers use creative ad copy when bidding on competitor keywords that will help make their ad stand out. 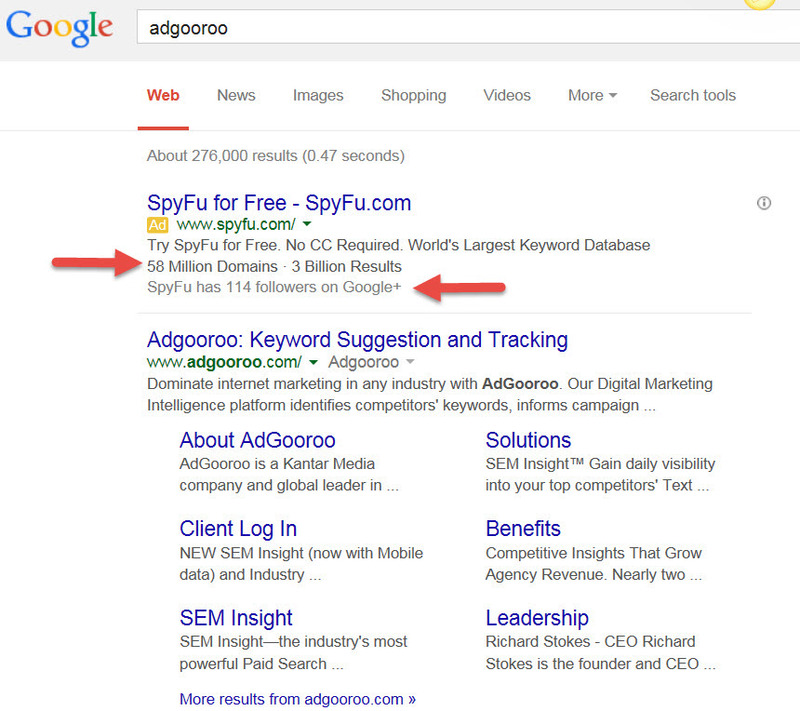 The SpyFu example uses callout extensions and social extensions to make their ad stand out. Olive Garden is using sitelinks and a clever ad. Both of these ads have obviously earned a high enough quality score to appear at the top of the page with extensions. I stand behind this strategy – while it’s difficult to achieve a high QS on competitor terms, these examples show that it is absolutely possible. Another way to be sneaky is to bid on these terms with RLSAs. It’s hard to understand why the ad shows up so inconsistently, and you’re really bidding for a user who was on your site and now it about to look at your competitor’s site – great way to bring them back before you lose them to the competition. #1 and #3 were interesting, but that cancel idea is a great one. Very creative. I’m going to have to give it a try.